Golden Peacock Leadership Award is awarded annually. Each category, at the discretion of the Jury may have more than one award. Each winner receives a trophy together with a certificate. Anyone may submit a nomination for the Leadership Award with the candidate's permission .Candidate must be serving in any business / industry and have also been contributing towards transformation with outstanding achievements and have made outstanding contribution towards the society. 1. Decision of the Award Jury is final and no appeal or correspondence will be entertained. 2. Award Secretariat reserves the right to award more than one organization as the winner, and could also withhold award(s), if the required standard is not met. 3. Award Secretariat accepts no liability for any loss resulting from the disclosure of information concerning an entry to Assessors or Jury members, though all reasonable precautions will be taken to maintain secrecy. 4. Award Secretariat cannot undertake to return documents or supplementary material submitted with an entry. 5. Award Secretariat reserves the right to alter the Award Scheme, at any time. 6. Finalist Award applicants may also be invited to make a brief presentation to the Jury and/or one of the assessors may be nominated to confirm or clarify certain facts at site. Travel and stay expenses, if any, will be met by the applicant. 7. Award for each sub - sector may be given, even if there is only one application in any of the categories provided that it meets the qualification of minimum assessment (as decided by the Jury). 8. Jury may not approve any Award, if the applicants do not get the minimum qualifying marks. All entries/ nominations will be treated in strict confidence and the entire evaluation process is confidential. Names of applicants, commentary and scoring information developed during the review of applications are regarded as proprietary and are kept confidential. The Golden Peacock Awards Secretariat will take all reasonable precautions to ensure that applications and information therein are treated in strict confidence. However, in no way Golden Peacock Awards Secretariat can be held responsible for any loss of confidentiality to a third party, nor held liable for any damage (to goods or persons, financial loss or consequential) incurred through the breach of confidentiality or otherwise by the applicants or any third party. 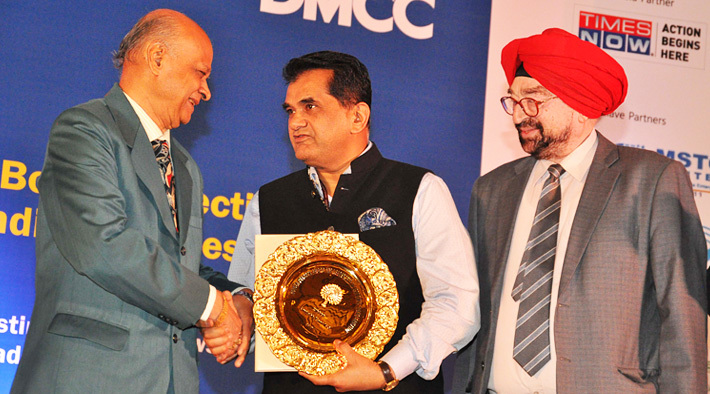 Amitabh Kant is presently CEO, National Institution for Transforming India (NITI). He is a member of the Indian Administrative Service, IAS (Kerala Cadre: 1980 batch). He is the author of Branding India-An Incredible Story. He has been a key driver of several international award winning campaigns, i.e. the "Make in India", Startup India, "Incredible India" and God's Own Country". These initiatives have positioned India and Kerala as leading manufacturing, travel & tourism destinations. In his capacity as Secretary (Industries) Govt. of India, he initiated the Ease of Doing Business initiative and ranking of States on defined parameters. It is a pioneering effort in India.